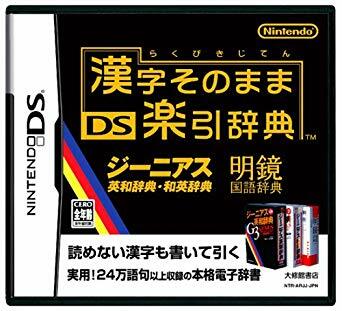 I use my Nintendo DS a lot these days, but not to play games – I’ve gotten hooked on a dictionary, specifically the Kanji Sonomama Rakubiki Jiten (漢字そのまま楽引辞典）. For about 50 bucks at a US video game importer, what you get is a pretty decent Japanese to English dictionary, an English to Japanese dictionary that is unfortunately useless if you don’t already know Japanese, and best of all you get the ability to draw kanji on the DS’s touch screen and have this thing try to look them up for you. Full disclosure: My handwriting is dreadful in either language. This thing still does a pretty good job of either dredging up the kanji I’m trying to scribble onto the screen or at least getting something close, at which point I can press a button and get a selector box of similar kanji to choose from. It’s not for someone brand new to the language – the interface is entirely in Japanese of course, so you need to read a little bit to get around – but if you have a few months of exposure this thing is really cool. This entry was posted in gadgets, nds, 日本語. Bookmark the permalink.